« Day 361 in Beijing: Moving Videos. Day 362 in Beijing: Nail Time! What does a guy do after moving? This guy gets his nails done, of course! One of the joys of being in China is that manicures are incredibly inexpensive. There is actually a mani/peid/blind massage store right in our little apartment building. Having “local” stores in the apartment complexes is fairly common here in China. We live in a 6 floor walk up and can walk right down to the first floor, open the door and go to the right and buy stuff from a tiny little convenience store (where the owners actually have their bedding in the room right behind the store so they live in their store) or one more door down and go to the nail saloon. To the left is a copy/printing store and then there are loads of Chinese restaurants in the next building over. Well, we usually go to the main shopping area, Yashow, but we wanted to see how the local one here was and if we wanted to become customers since it is only 1 minute away from us. We went in and met the cutest little doggie ever! As you can see, it actually has its nails painted also. It was super friendly, sweet, and goofy. The pedicure was incredible. It took about 45 minutes and, since we were celebrating just finishing our move, we asked if we could have a beer to celebrate. The women in the store laughed and didn’t mind at all. 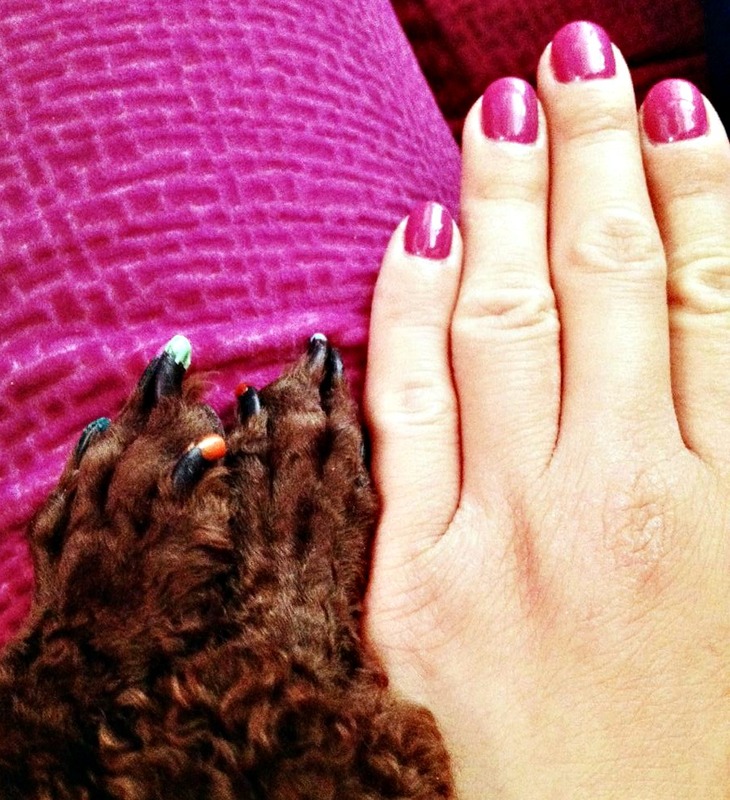 The nails you see with the doggie are our friend, Rachel, who helped us so much. The 45 minute manicure cost 30RMB. That equates to just less than 5 USD. I also bought a “buy 10 get 2 free” package so it comes out to about 4 bucks for a 45 minute manicure. The blind massage (which is also fairly common in China that people who are blind do massage) is about 100RMB for one hour. That is 16 USD for a one hour massage. We will go back and try that in the next few weeks and post about that soon!